Yellow-Shouldered Parrots are still found on the island of Bonaire. But there aren't as many of these pretty birds as there used to be. Let's look at this pair and then talk about what is happening to these birds. 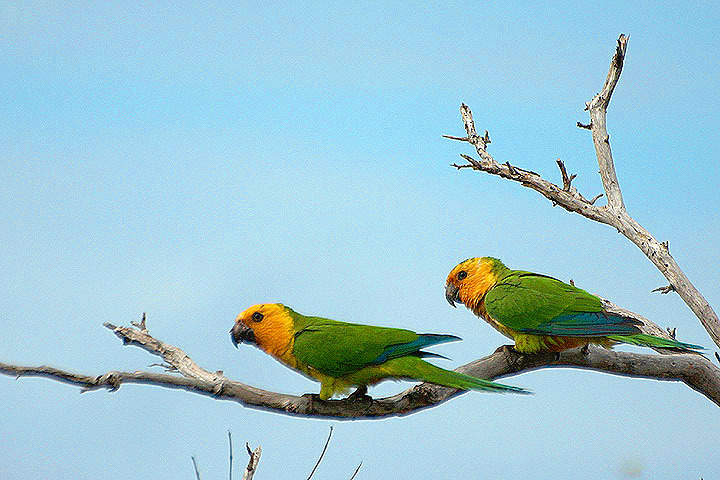 Yellow-Shouldered Parrots are found among the trees at the north end and west coast of Bonaire. We saw many of them flying among the trees at the hotel where we stayed during our visit in 2004. The birds were active in the morning and evening. They liked to eat the fruit of Geiger Trees, as well as many other kinds of tropical fruits found in the trees of the island. These birds made a loud, sharp squawking sound; very noisy when the birds were active. These Parrots became sleepy in the warm afternoons on the island. They would rest quietly in the trees, sitting on branches often side by side. Often there would be a small flock of birds sleeping together. What is happening to these birds? Several scientists have studied these birds, and the Island Resources Foundation has reported their findings. One problem is that baby birds are taken from nests to be sold as pets. Another problem is that resources are scarce on small desert islands like Bonaire, so any interference from people such as cutting down trees where these birds usually live and eat is an extra stress that the birds just don't need. Extra stress can be fatal in hard times, such as during a drought. The Island Resources Foundation has a good list of endangered birds of the Caribbean, and a nice page with lots of science information. The scientific name of the Yellow-Shouldered Parrotfish is Amazona Barbadensis. Notice the little bit of blue color on its wings. ReefNews President Jonathan Dowell took this picture using a Canon 10D digital camera with a Sigma 75-300 mm zoom lens. Copyright © 2004-2005, ReefNews, Inc.